It's important to keep the right amount of air in your tyres as all tyres slowly deflate over time. Check your air pressure monthly. Correct tyre pressure helps to ensure maximum wear from your tyres and optimises your car's comfort and fuel economy. Ensure you don't over-inflate or under-inflate your tyres. It is illegal to mix radial tyres with cross-plys on the same axle - it may cause your car to spin when braking hard. A spin could also result if you mix tyre brands on the same axle. 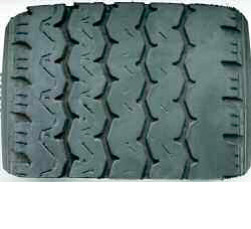 Tyre choice plays a major role in fuel economy. Simply changing from cross-plys to radials can help improve fuel economy as radials have less rolling resistance so the car moves more freely. This means the engine doesn't have to work as hard and requires less fuel. 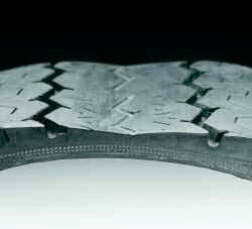 ◆ Tread wear issues appear as flat spots, or areas of rapid wear on the tyre. 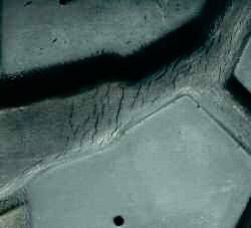 They can also be seen as deformed tread blocks or cracking in the tread area. This type of wear is usually a result of brake problems, suspension or alignment problems, an unbalanced tyre and wheel assembly, or misuse. 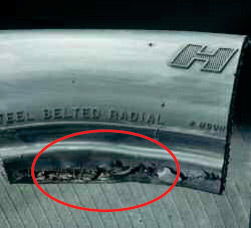 ◆ Sidewall damage appears as cuts, tears, bubbles, or scrapes anywhere along the sidewall of the tyre. 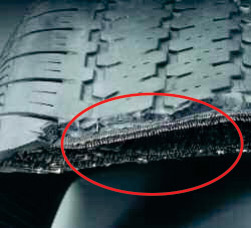 This type of damage usually occurs when a tyre encounters a road hazard. This could include anything from a curb to a boil or piece of metal. 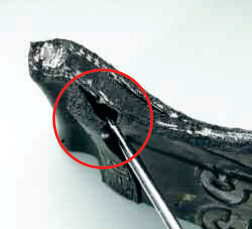 Sharp objects or very concentrated stresses usually cause cuts and tears. Bubbles and scrapes occur due to impact damage or prolonged abrasion. 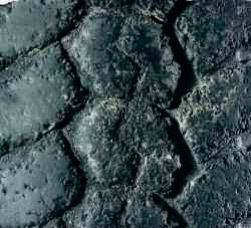 ◆ Separations appear as bulges on the shoulder of tread face, or as localized wear above the separated region. A groove worn along the shoulder could be a sign of separation. Separations are mainly caused by abnormal heat build-up. Excessive heat can build up during prolonged high speed driving, overloaded or under-inflated tyre conditions. Separations can also be caused by penetration of water or foreign materials into the carcass of the tyre. This material enters through cuts caused by road hazards. 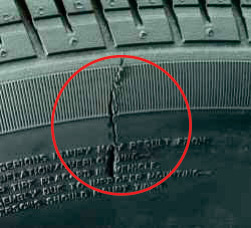 of the tyre is usually evidence of separation. 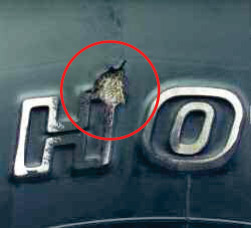 ◆ Road Hazard Damage appears as protruding objects or cuts in the tyre. 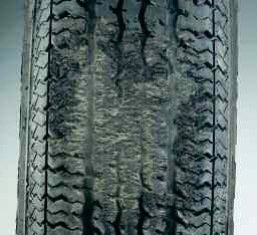 Misuse or neglect appears as wrinkles in the inner liner or scuffling that extends around the circumference of the tyre. 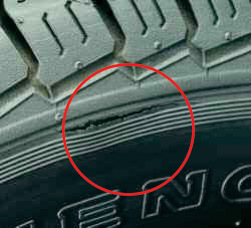 Road hazard damage occurs when a sharp object comes in contact with the tyre. 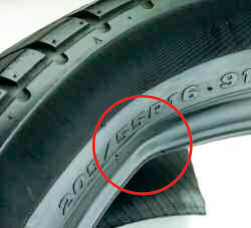 Misuse and neglect can occur to severely under-inflated tyre or to tyres with insufficient clearance between the tyre and fenders. It can also occur when dual axel tyres are overloaded, or there isn't enough clearance between the two tyres of the assembly. through the inner liner. in the inner liner. 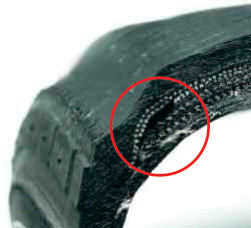 Bead Problems appear as a broken bead, chafing of the rubber around the bead, or deformation of the bead area. 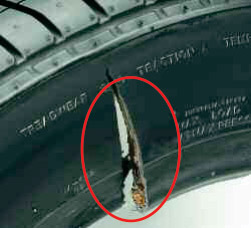 A broken bead can occur when a tyre is mounted on an improper rim or carelessly mounted or dis-mounted. Bead chafing can occur when mounting a tyre on a dirty or mismatched rim, or when the tyre is in an overloaded or under-inflated condition. A bent or deformed bead usually occurs when the tyre is improperly stored, or excessive stress is applied to the bead area during mounting.